The flagship race for Adrenaline Rush Sports LLC is the Black Swamp Dash, located near the banks of the Portage River in Oak Harbor, OH. This was my first trip out of the state for an event, so I was excited to see some new territory, and a new event. Throughout the week, a warning of impending weather was upon me, but that’s up to the weather gods, and not the OCR world. I imagine all/most of us have experienced a little “extra” in the way of weather when it involves our events. Hot/cold, rainy, windy, snowy? Once we are signed up for an event, it’s all hands on deck, regardless of the weather. After a scenic trip through rural Ohio, I arrived at the Ottawa County Fairgrounds; the location of the Black Swamp Dash. I arrived early, as I like to get a minute to get ready for an event, and I ended up beating the majority of the volunteers there. I had an opportunity to speak to the two race creators. A wonderful husband/wife team who I immediately determined are very passionate about the sport, and their creation. They stated that they had been working on the event since November. Clearing the course, creating/setting up obstacles; and determining ways of making this event the best it could be. It’s great to see that amount of passion from event creators for the sport and making sure it is a quality event. I was about to realize the passion of their creation firsthand. The registration was fairly easy, and allowed us to head over to the course in a timely fashion. The main section of the course is visible from the grandstands located at the venue; a very view-friendly venue. A DJ booth was also positioned just outside the starting gate. The speaker location could have been somewhat better by placing them outside of the booth to allow the sound to carry a little more as it was contained in the overhang of the structure. This was a timed event with timing chips in the bibs, so I was pleased I word my XRacewear shorts with the mesh bib holder(which has saved its share of bibs already) to avoid not having my time recorded. Many of the participants were new to the sport that I had an opportunity to speak with; so it allowed for an opportunity to help them realize that there is nothing to worry about finishing time, etc. I told them to enjoy themselves and not worry about a thing other than having fun. Their expressions seemed to ease as they began to see the event as an opportunity to have fun and test themselves. With a 3-2-1 countdown, we were off. The race began out of the infield area into an adjoining field area. Shortly in to that area, a row of alternating height hay bales crossed the running lane. This was a good use of a natural product that makes for a good obstacle, and a way to break up the crowd. I had pulled away from the other participants at this time, but I was looking to put in a good time. 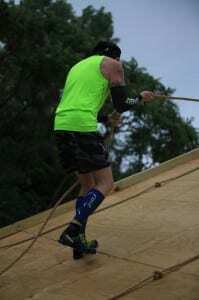 The course continued to wind through the field area adjacent to the main event region, as I came upon the next obstacle. “Gladiator” was a great obstacle created for this event. It entailed an angle rope climb to a platform where another cargo net spanned an area that needed to be rolled across to prevent a wayward step allowing your foot to slip through. At the end, another angled wall rope climb descended the obstacle. 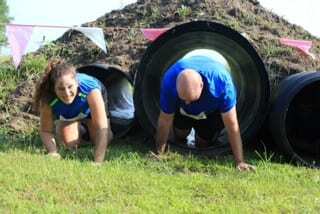 Nearing the wooded section of the course, I first had to make my way across a field of piled tires. All shapes/sizes were present, and made for difficult footing as the tires were flipping and falling as I crossed them. Shortly before reaching this area, the thunder began with lightning flashing across the sky to the north of the event. Far enough away at the moment, but bringing signs of impending weather on the horizon. Following a cargo net climb, and descending into a muddy area; the wooded area loomed. Immediately upon entering the area, the sun seemed to be swallowed up. It seemed reminiscent of the journey Bilbo and the dwarves took upon entering Mirkwood on their journey to the lonely Mountain. My hat is off to the Adrenaline Rush Sports team as they did a great job of cutting a swath through this dense, heavily vined forest. Also reminiscent of Mirkwood, the event presented a new obstacle in the heart of the woods. The “Widow’s Web” entailed many criss-crossing rubber “strands” to impede the progress of the runners. It was a unique use of the materials, and the woods to create a challenging experience for the runners. Thankfully no giant spiders to hinder our progress even more! Exiting the woods, the rain began, and the sky darkened almost to the level of light in the woods. The next obstacle was one that I had yet to experience, but it was a great variation of rock climbing. The obstacle entailed a vertical wall with wooden pegs attached to it at different intervals. A standard pallet-style ladder descended back to the course. Rounding a turn, the balance beam “walk the line” presented itself. A challenging tribute to Johnny Cash was a 6” wide beam alternating up/down over water. Enough challenge to make the obstacle formidable. Just as I thought I would be able to breath free in the open, I was re-introduced to the smothering forest section again. Sliding down into a stream, I was welcomed by the trademarked Black Swamp Mud. I was now wearing socks and shoes of mud as I dove back into the forest. A few more twists and turns with some leaping over logs took me back out. Many courses have a tube system to climb through, and Black Swamp brought their own version of it. In this “choose your own adventure” obstacle, you could wither climb through one of the exterior tubes that were narrow, or the larger one in the center. I opted for the smaller tube, and began to crawl. Immediately, I identified that the height of the tube did not even allow you to crawl on your hands/knees. So, after a tremendous ab workout of planks, I was through. Good show Adrenaline Rush Sports! Nearing the end of the course, a 12’ tall pallet wall loomed. Nothing too complicated about it, but with the rain now intensifying; it made the rungs somewhat slippery. Another thing happened at this point, and I identified that I had been running alone for some time. I had distanced myself from the rest of the field quite a bit. Later I would discover that the rest of the field opted to be taken back to the main area to run later due to the weather. At this point, there was no turning back for me. After a few twists and turns nearing the infield area again was another chance to crawl. This time it was 25’ of weighted chain link fence to crawl under. Had I another few competitors to crawl under this with me, it may have been supported more. With the rest of the field taking an early exit, I was on my own to shoulder the full weight by myself. Being that this was near the end of the course, it taxed me quite a bit. Not to be outdone with their climbs, I made it to the granddaddy of cargo climbs; a 16’ cargo net climb to gain a full view of the course. The rain was really coming down at this point, actually to the point of making it difficult to see; on to the last obstacle. No good event would be complete without a crawl through mud right? Now, with the monsoon intensifying, I crawled my way to victory. My fellow competitors were all now huddling under a tent applauding as I was the lone survivor of the first heat of the Black Swamp Dash that morning. I was greeted by one of the event creators with a medal and a bottle of water. Enough of it was falling from the sky, but it sure was a great way to be greeted at the end of this quality event. I made my way back into the registration building and began to wait out the rain. I was advised later that the area received over 3 inches of rain in a half hour’s time. With this being my first excursion out of the state, and a new event; I was pleased. 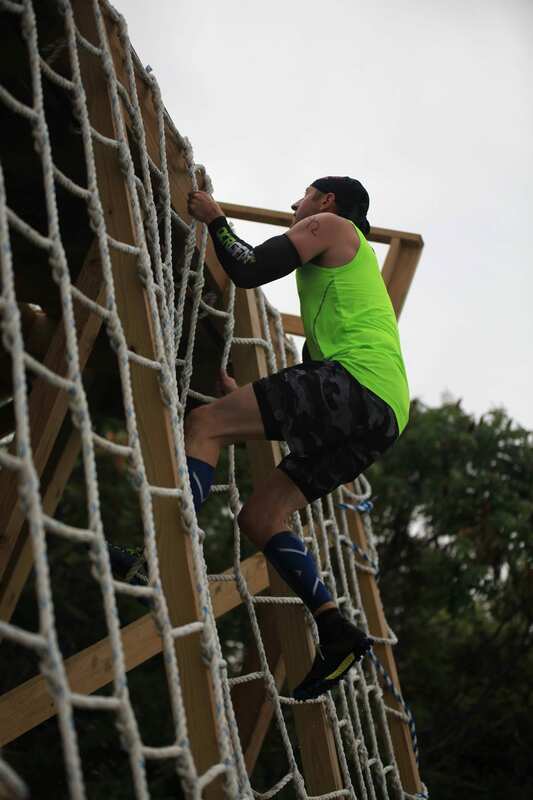 The venue at the fairgrounds didn’t allow for a lot of hills or other topography; however, the event creators did a great job utilizing what was available along with very well constructed obstacles. Everything was very safe, well built, and well thought out. Even with the rain gods attempting to hinder the event, I still thought it went off very well. Another casualty was my time, as the storm knocked out the computer tracking the time; so I don’t know exactly how I finished compared to any later competitors. Even with that, I feel I would have given them a run for their rain, er money. 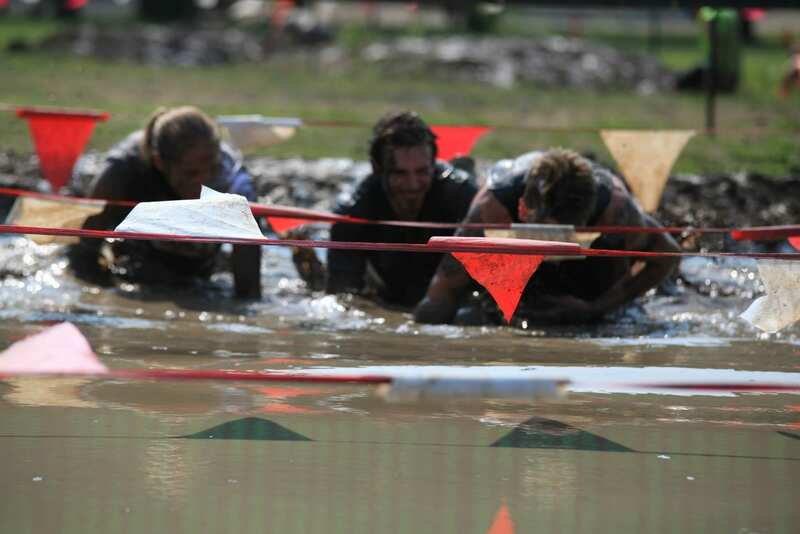 Did you do the Ohio Black Swamp Dash? Share your own rating & review about the event today!